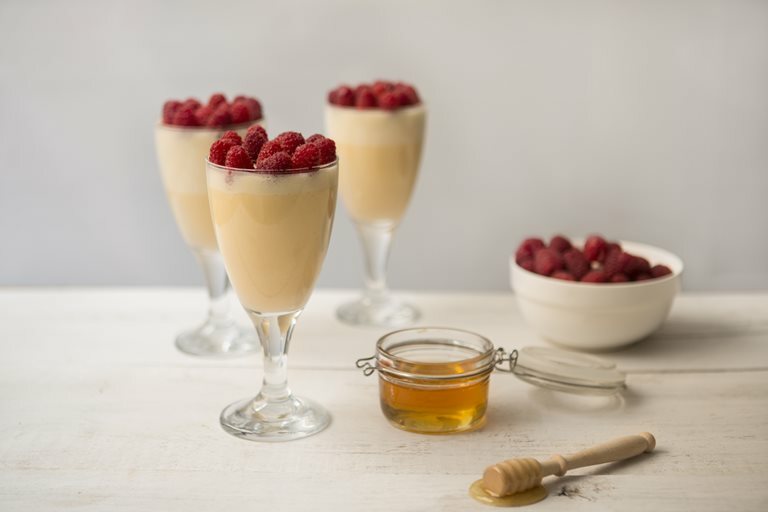 Victoria Glass shares with us her thoughts on Scottish sweets, along with a recipe for a superb Scottish honey mousse enlivened with whisky and topped with in-season raspberries. Last week I wrote about savoury Scottish comfort food. This week it’s all about the sweet stuff. Scottish puddings are certainly not shy of a calorie or two and, like most traditional Scottish recipes, tend to be made up of locally sourced ingredients. This is why so many of them feature raspberries, oats, heather honey and, of course, whisky. Some of the more well known Scottish puddings are clootie dumplings, Tipsy Laird, black bun and, of course cranachan. Clootie dumplings are quite heavy suet and oat puddings, nicely spiced and studded with dried fruit – delicious, hearty fare that you’ll probably have to undo the top button on your jeans to finish. Then there’s Tipsy Laird, essentially just a trifle, but made with raspberries and whisky (of course) instead of sherry. And on to black bun, traditionally a celebration cake for Twelfth Night and now Hogmany, which is a fruitcake encased in pastry. Yes, that’s right, a cake encased inside a layer of pastry: a cake pie, if you will. What’s not to like? The most famous Scottish pudding is, undoubtedly, cranachan. A good cranachan is hard to beat, though too often I’ve been served a disappointing bowl of whipped cream, sweetened with honey and flavoured with barely a thimble of whisky, that I’ve had to wade through to find any sign of juicy raspberries or tasty oats. There’s no chance of such scrimping if you make it yourself and it’s a quick and easy treat to rival any. You can follow my recipe for fool-proof cranachan here and you can also find the recipe for shortbread, whisky mac jelly and a chocolate and Drambuie layer cake (complete with a tartan shell) on the same page. As the weather has been so nice over the last week, I decided to create a lighter pudding full of Scottish flavours that is also gluten-free, so my gluten-dodging boyfriend wouldn’t have to miss out. 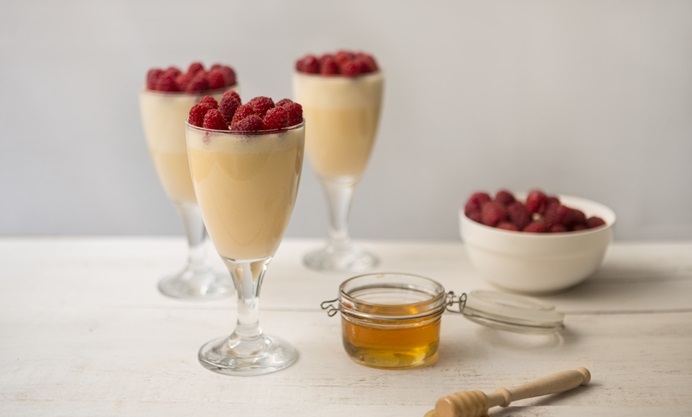 And here it is: honey and whisky mousse topped with raspberries. It went down a treat, if I do say so myself, and the lightness was welcome after a rather generous plate of stovies.